I know… The mere suggestion that we not pick up a crying baby sounds callous, even criminal to some. 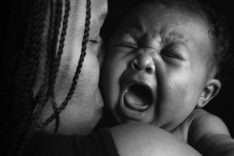 No doubt, soothing a crying baby is a healthy instinct that can never be wrong, but since crying is communication — one of the few ways preverbal children can express a wide array of thoughts and feelings -– shouldn’t we first observe and listen, however briefly, so we might discern what our baby is really saying? This assumes, of course, that we believe babies are capable communication “partners” and want to encourage that partnership. It assumes we are aware that even the youngest infants are able to connect with us person-to-person, mind-to-mind, heart-to-heart, feel our support and receive our empathetic responses. It also assumes that babies are whole people who (just like us) ultimately feel calmer, more confident, connected, more themselves with people who “get” them, rather than those well-meaning adults who preempt listening with an immediate reaction. If Michael had wanted to be picked up, he would have let his mom know. In previous instances, Michael’s mom picked him up right away, and we noticed that he would almost immediately lean toward the floor and indicate his wish to go back down and continue playing. Since Michael is able to scoot across the floor, he can clearly indicate his wishes to separate from his mom to explore and can also autonomously return to his “secure base”. After viewing the video, it seems to me that Michael was expressing stranger anxiety. A father had arrived who hadn’t attended this class before, and his presence seemed to instigate Michael’s reaction. Michael then needed to check in with his mom and tell her about it. I trust you to tell me what you need. I won’t wither or panic when you cry. You are capable of handling this situation with my support. Michael’s mom and I are learning that he is a gifted communicator. He vocalizes thoughts and feelings readily. Babies like Michael, especially, need parents who can calm themselves and patiently listen rather than reacting as if everything they express through crying is a crisis or immediate call to action. These children are a blessing, because you never need to doubt that they will tell you what’s going on. I predict many more of these lively and earnest mother and son conversations in Michael’s future. I love this video! It so clearly shows the value of putting the child in the lead. Thank you and Michael’s mom for sharing it with us. You’re so welcome, Sandy! I think these videos help us to understand that these babies really are small people with a wide range of feelings and ideas to express. Besides that the baby wasn’t crying (or maybe it’s just so obvious to a dad of 4 that the baby was “talking” or interacting rather than panicking or begging to be removed) I love your commentary. I can’t remember back to when I had only the one child, but I see myself in other new parents rushing to save a baby that isn’t interested in being saved — just wants to say something or get something so he can continue his quest to dominate the world. Alex, you’re a dad of 4?! I had no idea! You always have such interesting, thoughtful things to say. Yes, it is so easy to rescue babies; much harder to use the restraint necessary to understand them. Thanks, Allison. Not overreacting is definitely something we try to focus on in RIE classes. It can be challenging! “Cyber mentor”… I like that. Thanks, Carina! I noticed that my heart beat elevated a bit and my mind started to question “What is going on? What does he need?” I can imagine that this not knowing is a feeling many new parents get and I can completely understand the compulsion to want to pick the child up and stop the discomfort. I think there is magic in what you teach! A shift in my perspective to being curious about communication calmed my subtle discomfort. When I was calm, then it was easier to stay with the boy’s experience. When I was calm there was no need to stop the discomfort. Once I read the commentary, I fell in love with your comment about Michael being an excellent communicator. A person could so easily label him as ‘fussy’ and miss the beauty of his openness to sharing what he needs. That small perspective shift can undoubtedly have an impact on his entire LIFE! Buffy, your thought process and discomfort is mine exactly…even after thousands of experiences like this one. I don’t think that really ever goes away, so I guess this is an example of placing our child’s emotional needs before our own. But we end up benefiting, too, because being able to communicate with our children makes parenting about a million times easier…and richer…and more successful! Thank you, Buffy! As always, your comment is spot on and much appreciated. As always, today’s post provides such an insightful look at sensitive infant caregiving. I routinely share your wisdom with child care professionals who work with infants and toddlers. The conventional wisdom that they are taught is to “respond to” (i.e. 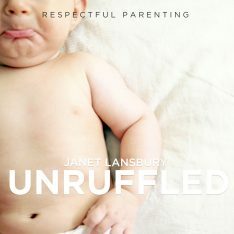 pick up) a fussy or crying infant. While that’s an improvement to ignoring them, you elevate the sensitivity of the response so that the caregiver is respectfully listening and interpreting the child’s communication. That is a skill that very few professional infant caregivers have, unfortunately. So keep writing and I’ll keep sharing with the ECE community!! 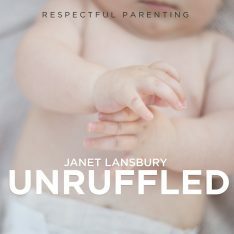 I’m so happy about this post of yours Janet. I already said this on Facebook, but I believe so strongly that parents own anxiety and desire for action causes a reflexive intrusiveness that costs babies their sense of self before it even fully develops. What is great about RIE class is that you get explicit permission to sit back and let go of the fear of what others may think or say. The depth of the relationship and respect between this mom and her son is inspiring. Lucky pair! “…parents’ own anxiety and desire for action causes a reflexive intrusiveness that costs babies their sense of self before it even fully develops.” Wow, well said, Miven. Thank you for this insight and your corroboration. I find this fascinating. All my instincts tell me to reassure and comfort and jump in and help. I am trying very hard to stand back, observe, listen……its so hard sometimes but I tell myself i am building my childrens’ confidence levels and their capacity to cope. I can’t be there every moment of the day and need to know they can deal with minor conflict or anxiety without me. My middle child is 4yrs old and is extremely sensitive to everything, he is clingy and doesnt like strangers or large groups of people. At 6 months he cried at social gatherings and needed to be held. 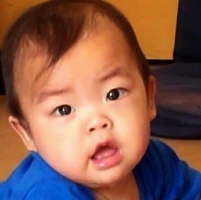 At 4 things have improved and he has adapted to school but does cry easily. I was reading a book called The Highly Sensitive Child – where they recommend giving your child all the reassurance they need, not overstimulating them with too many after school play dates, giving them quiet time, but also encouraging them to push their boundaries in a safe way (eg playdate with a friend and younger brother with similar temperaments, taking him to parties but allowing him to stand back and not participate, play sport and activities where they are alongside others not head on or contact). This works for him but I am struggling to walk the fine balance between providing a safe haven and pushing him (which can result in extreme distress and set backs). This seems a genetic trait which my inlaws have and they dont worry about it – but they dont want to do fun stuff like fireworks or disneyland. I am hoping that by having a mother who is sensitive but more extroverted, that i can gently coax him out of his shell! I’d be curious if any of these parents have experienced colic? Or had an infant that cried pretty much 24/7. I still have PTSD from my first and now my second is the same. I’ll do anything not to hear that crying. I get anxious, tense, unable to function, when my baby cries inconsolably. I want to fix it. When she’s seemingly uncomfortable in her own skin, I need to help her. I find the video fascinating and very impressed by the communication between the baby and the mother had been apparent and well understood. I just learned from watching this video that it was not a good idea to deprive them of expressing their real intentions of crying, they have their way of letting a mother know if they need to be picked up or just afraid from something new to their sight. Now I understand that everything is so wrong not learning how to read the babies inner message that we adult do not see it right away. Yes to all that. Thank you for commenting, Gazelle!